Today was another spectacular day to velo-commute. However, an interesting thing happened to me on the way home tonight. Let’s start with a little background. I leave my house by 6:45 am. At that time there is little traffic. Still, as a commuter I follow the rules of the road. That said, I do take a few liberties when needed. For example, I know the cycle of the lights pretty well. I know that if I’m at a light and there is no traffic moving in my direction at the light then it’s not going to change to let me through. So if I’m there through at least one cycle and still no traffic I’ll sneak through on someone else’s green light but only when it’s safe and when I know I won’t impede traffic or disrupt the flow of the intersection. I will sometimes roll slowly through a stop sign after a car has passed and no one is waiting to get through. However, during the afternoon commute, when there is much more traffic to contend with, I follow the rules implicitly. I stop at stop lights, behind traffic as if I am also a vehicle. I stop at stop signs and wait until it’s my turn, just like any other car. So now I get to the interesting part of my story. I’m at an intersection where there are about 10 cars waiting to go through. It’s the less busy way through the intersection so the light isn’t as long as it is for cross traffic. At this point I have two choices. 1.) Ride up along side of traffic to the light so I move in front of everyone or 2.) stay behind the last car and wait as a car would do. I chose the latter because it’s the right thing to do. As the traffic in my lane starts to flow I get on and pedal easy, though I move to the right as I’m trained to do on a bike. Herein lies my mistake. The car behind me sees an opportunity to move up past me, even though we are both moving slowly to the next light cycle. I really couldn’t believe this was happening though I shouldn’t have been surprised. So as she slowed (yes, it was a woman) I kept moving and pulled in front of her and centered myself in the lane so she couldn’t do that again. Here I was trying to do the right thing, acting as a vehicle, and she was going to crowd me out for it. Sheesh! I know it seems like I’m talking out of both sides of my mouth with the two scenarios for vehicular cycling. But they are indeed very different. If I thought that I could move through the intersections normally, as a car would, on my commute to work I absolutely would. With the lack of traffic it would be almost impossible to arrive at work within a reasonable time. So what would you do in both of these situations? Do you encounter these same issues on your commute, or on your training rides when getting through intersections? This was how I got to work today. It’s really the first time I’ve been on a MTB. I usually ride my road bike and use a messenger bag for all my “stuff”. Last night I decided to take some time to put on the Quattro pedals we bought for it a while back, put the cleats on a spare set of shoes, and also put on the quick release rack. I pumped up the tires so it would be ready to roll. I think I was a little excited about riding a different bike for my commute because I was up before my alarm. 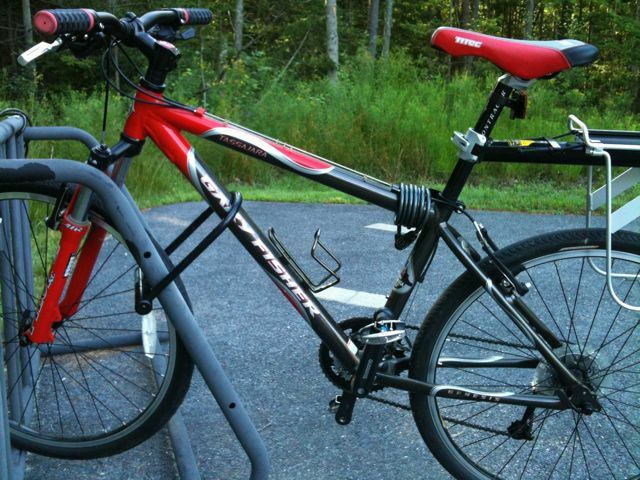 Instead of dawdling, I got up and ready to leave a little earlier, knowing the bike would probably be a bit slower. Also I wanted to stop off at the store on my way to pick up some fruit for snacks. I knew I would be able to manage it easily with the panniers on the bike. Today was really a test for me in that I want to commute more by bike. Sometimes an errand or the amount of things I need to transport is a limiting factor. If I can manage ways around that with a different bike then there are fewer excuses not to velo-commute. How does life get to be so busy that I just can’t find the time to blog? Fortunately my busy life has included some incredible outdoor riding in some unseasonably warm spring temperatures. Normal temperatures for Maine this time of year is in the 40-degree range. Lately many days have been in the mid 50’s. We even had several days this past week in the 60’s. 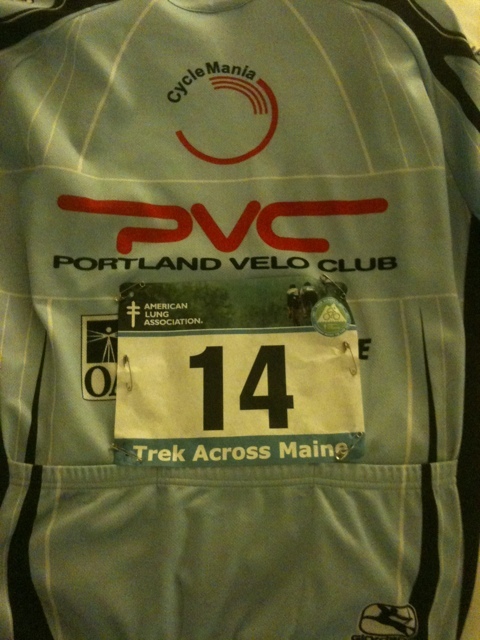 Several Portland Velo Club women joined me on rides this week. 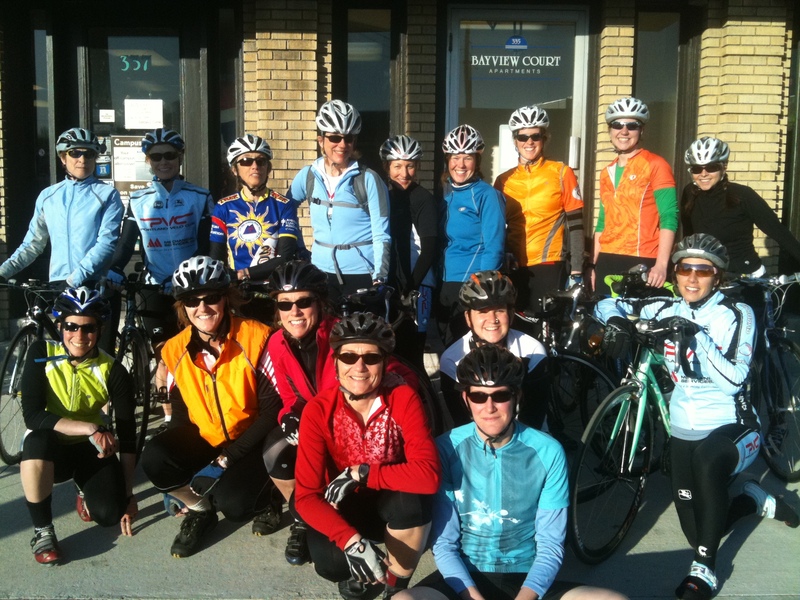 We even joined another women’s ride Wednesday for a total of 17 riders that night. This has been a long drought of snow. I think our last significant snow storm was in December or January. But it’s been fine by me because I’ve been able to be outside biking a fair bit this winter. Now the weather has been unseasonably warm, driving more of us out on our bikes. Today I managed to get out for an early morning group ride with the PVC Women followed by 90-minutes of yoga. I left the house at 6:30 am and managed to return at noon. Two things I love to do but took up half my day. Now, that doesn’t mean that it always take up half my day, it just worked out that way. The weather is turning cooler next week but with Daylight Savings Time I’ll still be able to be out on the road after work for some training rides as long as we don’t see any snow. This post has been a while in the making. Unfortunately I’ve just been too busy to get to it. Several weeks ago, for Valentine’s Day, my Valentine gave me a power tap for my bike, which I have been wanting for a long time. So I’ve had the device installed on my bike for a couple weeks now. I’ve used it outside and inside. It’s actually kinda cool. And as we all know, it’s the best way to measure performance and thus progress in training and fitness. Since it’s only been a couple weeks I can’t actually say much about it. It’s going to take some time to learn more about it and how to get the most out of it. It will probably require me to purchase a book on how to train with a power meter. At the cost of <$20.00 that’s a pretty inexpensive must have. For the time I have spent using the power meter and getting used to the software it’s been great. The software is super easy to use, read and gather data. Luckily the weather here on the coast of Maine continues to be really nice with now snow in weeks and what precipitation we did have fell in the form of rain. And with temperatures predicted to be in the upper 40’s and low 50’s it’s going to be a great weekend to get out and use the power meter on the road.